Having immigrated to the United States in 1884 with little more than a letter of introduction in his pocket, Serbian Nikola Tesla would change the world with his inventive genius. He had worked in France with the Continental Edison Company, and now in America, he worked with Edison himself to improve the great American inventor's direct current generators. Tesla believed he was promised $50,000 if he could solve inefficiencies, which he did, but Edison assured him that the agreement was merely a joke, and the Serbian was paid $18 a week. Another argument over money would cause Tesla to quit and venture out on his own. 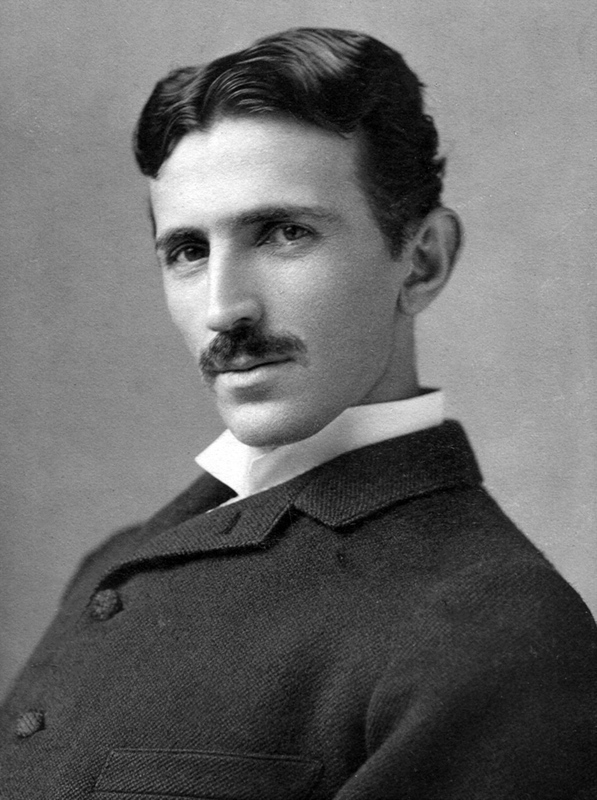 Tesla Electric Lighting & Manufacture allowed him to work on his own projects such as X-ray research, radio transmission, and inventing the “Tesla coil”, but money was difficult to come by. His major development was pushing his “alternating current” generator, which allowed for long-distance transmission of electricity far more efficiently than Edison's DC. Tesla joined forces with the Westinghouse Electric & Manufacturing company, providing his generators to their electrification program. Competition between Westinghouse and Edison erupted in what is often called the “War of the Currents.” While AC was logically the superior technology, Edison would not give up his monopoly of having short-range power plants on every block. Each company launched enormous public relations and advertising campaigns, the most famous being Edison's display of the dangers of alternating current by electrocuting an elephant. Eventually, AC would win out, but the cost of the war would be disastrous. Edison had other companies to fall back on, but Westinghouse was ruined. In 1897, Westinghouse met with Tesla to tell him of his company's financial problems. Tesla, who had always appreciated Westinghouse's faith in his ideas about alternating current and Niagara Falls, sat back in his chair to ponder how to offer help. His royalties on each kilowatt generated was costing Westinghouse a fortune, and he could give great aid to his friend if he were to waive them. Instead of tearing up his contract outright, Tesla offered a ten-year pause on payment. Westinghouse was delighted to take the deal. The next decade were lean years for Tesla. He set up his laboratory at Colorado Springs, investigating the ionosphere and inventing his Teslascope. In 1900, he began a radio-transmission tower at Wardenclyffe to achieve trans-Atlantic contact, but his time and money was consumed in an ever-escalating legal battle with Guglielmo Marconi, the showman who had absconded many of Tesla's radio patents. By 1907, Tesla was nearly bankrupt, but Westinghouse came through with his promise of the return of Tesla's overdue patents. Armed with extra funds, Tesla was able to achieve legal victory with Marconi handing over patents and back-payment. Eventually the two would be rectified when they received a joint Nobel Prize in 1909. Marconi would take over Tesla's public operations, working out an agreement that would allow both to profit in the growing radio technology. Tesla, meanwhile, would return to his well funded laboratories. As World War I approached, Tesla, Westinghouse, and Marconi would present new weapon ideas to the US Army. Radio-controlled torpedoes, RADAR, and a “peace ray” that used teleforce to destroy any incoming airplanes all came into development by America's introduction to the war in 1917. By the end of the war, the US Army was beginning experiments with ion-propelled electrically-based planes that would be the short-range jets of the 1930s. Long-range broadcast would allow the public air travel of the 1950s to surge, eclipsing trains worldwide with cigar-shaped flying ships. In the 1920s, Tesla would turn his attention to field theory. After much work, on his 81st birthday, Tesla announced his “dynamic theory of gravity.” The theory would override much of the work of Einstein's Theory of Relativity, which would prove to be a mathematical illusion more than hard physics. While the science was established early, it would not be until the 1960s that effectively engineered gravity-drives would propel American astronauts to the Moon and, in 1986, to Mars. Tesla would die January 7, 1943, over a year after his Tesla ray would prove defensive capabilities in the Battle of Pearl Harbor by destroying the second and third waves of Japanese attackers. The world would mourn its greatest inventor. In reality, Tesla simply offered to tear up his contract with Westinghouse. The scientific genius was not known for his business-savvy, and the exceptionally generous offer cost him millions. Westinghouse, being a businessman, did not talk Tesla out of his offer, which saved his company. Tesla would struggle with money and lack of recognition through the rest of his life. Marconi dominated the radio industry while Tesla's Wardenclyffe Tower would fail from lack of funds and directions. It would not be until 1943 that the US Supreme Court finally awarded Tesla his patents (arguably as a way to avoid payment demanded by Marconi). The US Army and Navy would ignore his suggestions at weapon development, even though Tesla's newspaper editorials would correctly predict the length of the war and the failure of the League of Nations. Gradually, Tesla would descend into madness and die in severe debt and obscurity.